Thir13en Ghosts, based on William Castle’s classic 1960 B-movie, is so similar to the recent House on Haunted Hill remake (which shared some of the same key contributors) as to be almost undistinguishable. An impoverished family inherit a fabulous glass-walled house (“a living piece of art”) from their estranged uncle (F. Murray Abraham), who, unbeknownst to them, was a ghost hunter. The family quickly find themselves trapped in the house, (a fabulous Lament Configuration-type puzzle of cogs and pulleys that should have won Production Designer Sean Hargreaves numerous awards), which hosts a menagerie of trapped, malevolent spirits. 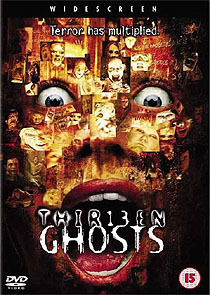 Thir13en Ghosts is an unpretentious popcorn movie with some first-rate production values that’s marred only by dialogue that makes the film play like one long exposition scene; a plot twist that challenges the credulity of the audience by pointlessly changing the allegiance of one of the characters, and a couple of questionable performances (step forward Matthew Lillard). Columbia’s disc presents the film in its 1.85:1 theatrical ratio in a very nice anamorphic transfer that perfectly captures Gale Tattersall’s clinically precise cinematography. The 5.1 audio mix (at 448kbps) is extremely aggressive, and features a couple of demo-quality sequences. The disc features an almost perfect amount of bonus materials for a film of this quality. There are no deleted scenes, but otherwise just about every other aspect of the production is adequately covered. There’s an informative commentary track by director Steve Beck, designer Sean Hargreaves and make up designer Howard Berger, and two featurettes: the first is a Making of… package (19 minutes) that explains some how the film presented some unique challenges (the crew were constantly aware of the need to avoid unwanted reflections, for example); the second is a compilation of minute-long mini-documentaries that tells the background story for each of the ghosts (these would have been better scattered among the menus as Easter Eggs, rather than presented strung together). Finally there are three trailers (Thir13en Ghosts, Hollow Man and Spider-Man, all presented with 16:9 enhancement and with 5.1 audio mixes). A music video by Tricky, on the Region 1 disc from Warner Home Video, packaged in a snapper case, is missing from this Region 2 Columbia Tristar version.